My roses don't even really have leaves yet, and this is what the buds/stems look like. Single shot, MP-E 65 at f/16, single flash with diffuser and fill reflector. Geez, what you need are some lady beetles...bad Every time I see a conglomeration of aphids like this, I always find myself picking over the photo to see if any are caught giving birth. The black ones (onion aphids) have infested my shallot seed stock. They're not supposed to like onions or garlic. off topic: Anyone know how to purge these things? I'd like to avoid nasty chemicals. The ladybugs didn't work (maybe they don't like onions either). 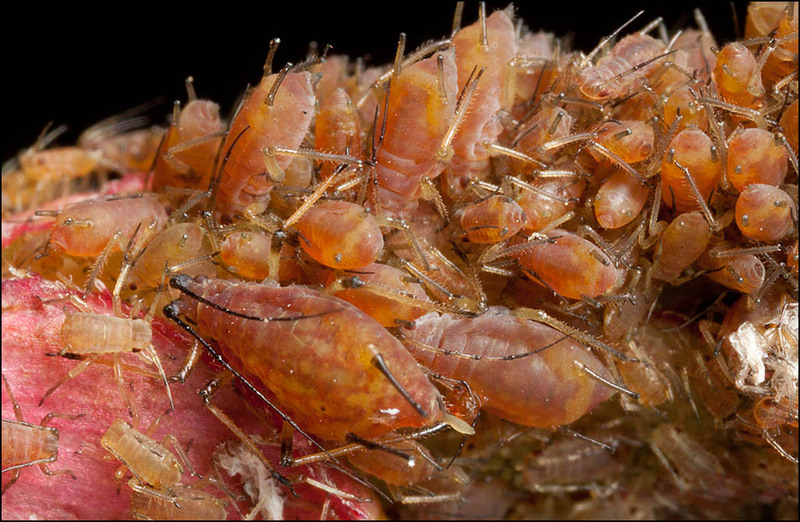 Every time I see a conglomeration of aphids like this, I always find myself picking over the photo to see if any are caught giving birth. That biggest one, bottom centre seems to be doing just that. So, that is Ken slightly happier, Rik slightly less so. Anyone know how to purge these things? I'd like to avoid nasty chemicals. The traditional remedy is to spray with water containing Soft Soap. It used to be available from hardware stores but an organic gardening outlet should sell it. Considering it was midnight and 38 degrees F when this picture was taken, I have to admire that delivering female. I confess, my garage has a small jar of nasty chemicals reserved for dealing with this situation. But then again, I don't eat the roses!